6–7 April 1966: Chief Test Pilot Robert G. Ferry of Hughes Tool Company’s Aircraft Division flies the number three prototype YOH-6A, 62-4213, from the company airport at Culver City, California, non-stop to Ormond Beach, Florida, a distance of 3,561.55 kilometers (2,213.04 miles). Bob Ferry set three Fédération Aéronautique Internationale (FAI) World Records for Distance Without Landing.¹ All three records still stand. Bob Ferry took off at the Hughes Airport at Culver City (just north of LAX) at 2:20 p.m., Pacific Time. The aircraft twas so heavily loaded with fuel that the test pilot exceeded the engine’s torque limit by 21% just to get airborne. When he established a climb he reduced the power to “red line.” During the entire flight he kept the engine at 105% N2 (a 2% overspeed). He landed after 15 hours, 8 minutes of flight. On 26 March 1966, Allison Engine Company test pilot Jack Schweibold flew the same YOH-6A to set three Fédération Aéronautique Internationale (FAI) World Records for Distance Over a Closed Circuit Without Landing of 2,800.20 kilometers (1,739.96 miles).² One week earlier, 20 March, Jack Zimmerman had set a Fédération Aéronautique Internationale (FAI) World Record for Distance Over a Closed Circuit Without Landing of 1,700.12 kilometers (1,056.41 miles).³ Fifty-one years later, these four World Records also still stand. Robert George Ferry was born 29 November 1923 in Hennepin County, Minnesota, the second child of Lucius M. and Charlotte E. Ferry. He developed an interest in aviation during his teen years. Ferry earned a bachelor’s degree from Florida Southern University. He entered the U.S. Army Air Corps in 1943 and graduated from flight training at Luke Filed, Arizona, in 1945. 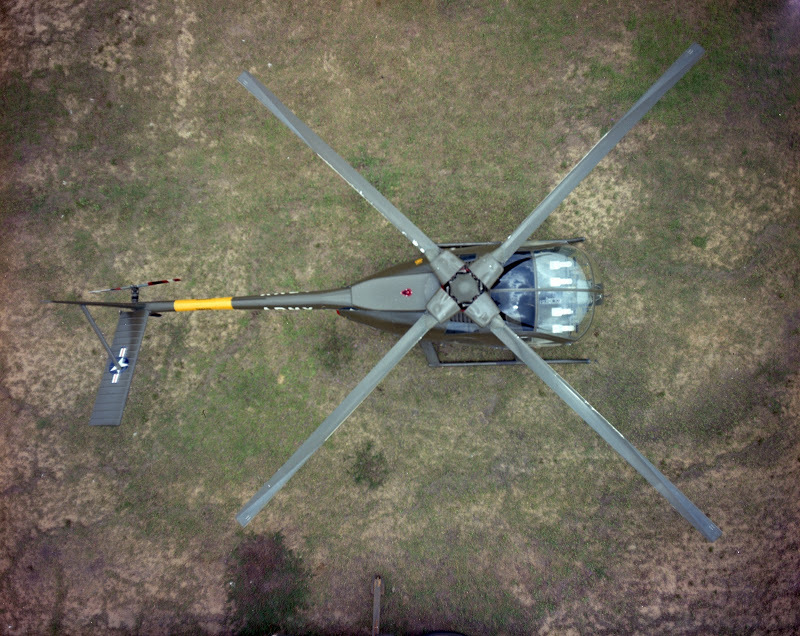 Ferry trained as a helicopter pilot at San Marcos Army Air Field, Texas, flying Sikorsky R-5 and R-6 helicopters. After graduation Lieutenant Ferry was assigned to Panama. In 1947, Robert Ferry married Miss Marti Holt of Austin, Texas. They remained together for 62 years. Assigned as a test pilot Bob Ferry flew the McDonnell XV-1 Convertiplane compound helicopter with pressure jet rotor drive and the Bell XV-3, an experimental “tiltrotor.” On 6 January 1959, he completed the conversion from helicopter to airplane mode. He also flew the Hughes XV-9A, an experimental high-speed helicopter, which also used tip jets to drive the rotor. After six years as a test pilot at Edwards, Ferry was assigned to duties in Germany. He retired from the Air Force in 1964 with the rank of Lieutenant Colonel. 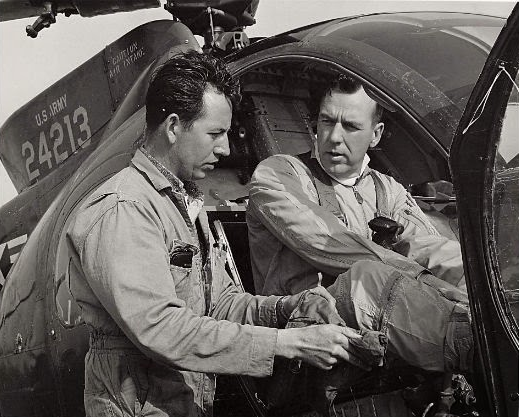 In 1966, Robert Ferry became chief test pilot at the Hughes Tool Company Aircraft Division at Culver City, California. He tested the OH-6A light observation helicopter and the AH-64 Apache at the Hughes facility at Palomar Airport in north San Diego County. During this time Ferry earned a Masters Degree in Business Administration from the University of San Diego. Bob Ferry retired from Hughes Helicopters after 18 years. He had flown approximately 10,800 hours in 125 different aircraft. About 8,000 hours were in helicopters. He had been awarded the Iven C. Kincheloe Award for 1959 by the Society of Experimental Test Pilots, the Igor I. Sikorsky International Trophy for his transcontinental record flight, and the 1967 Frederick L. Feinberg Award by the American Helicopter Society. 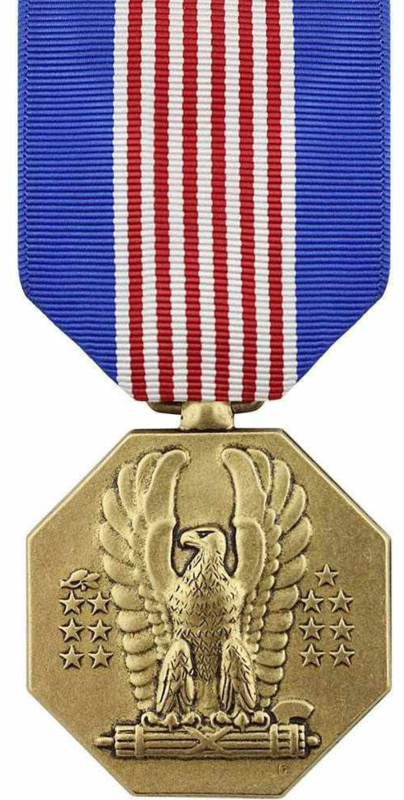 Lieutenant Colonel Robert G. Ferry, United States Air Force (Retired) died at his home in San Marcos, California, 15 January 2009 at the age of 85 years. 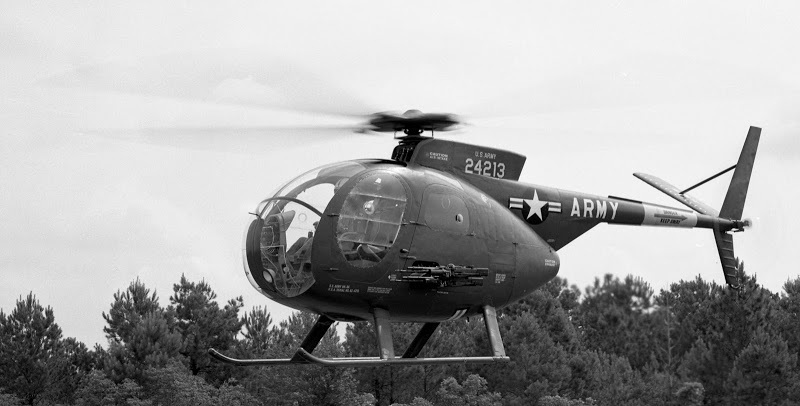 The Hughes Model 369 was built in response to a U.S. Army requirement for a Light Observation Helicopter (“L.O.H.”). It was designated YOH-6A, and the first aircraft received U.S. Army serial number 62-4211. 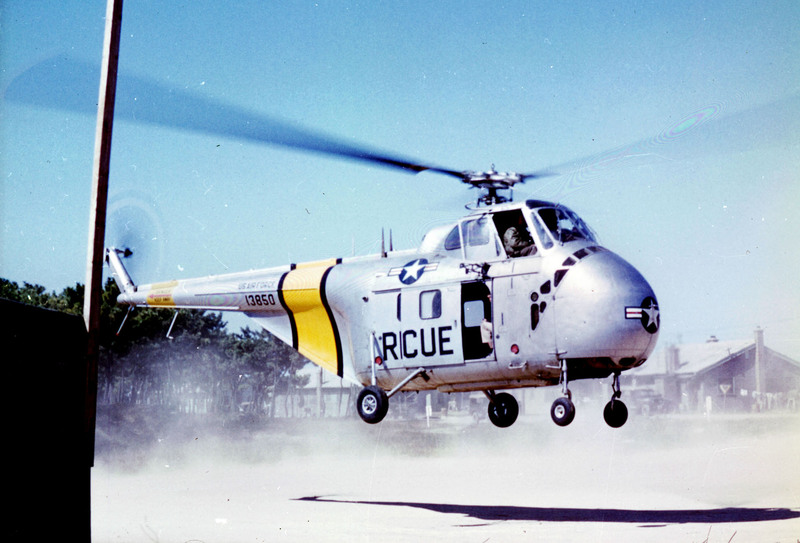 It competed with prototypes from Bell Helicopter Company (YOH-4) and Fairchild-Hiller (YOH-5). All three aircraft were powered by a lightweight Allison Engine Company turboshaft engine. The YOH-6A won the three-way competition and was ordered into production as the OH-6A Cayuse. It was nicknamed “loach,” an acronym for L.O.H. 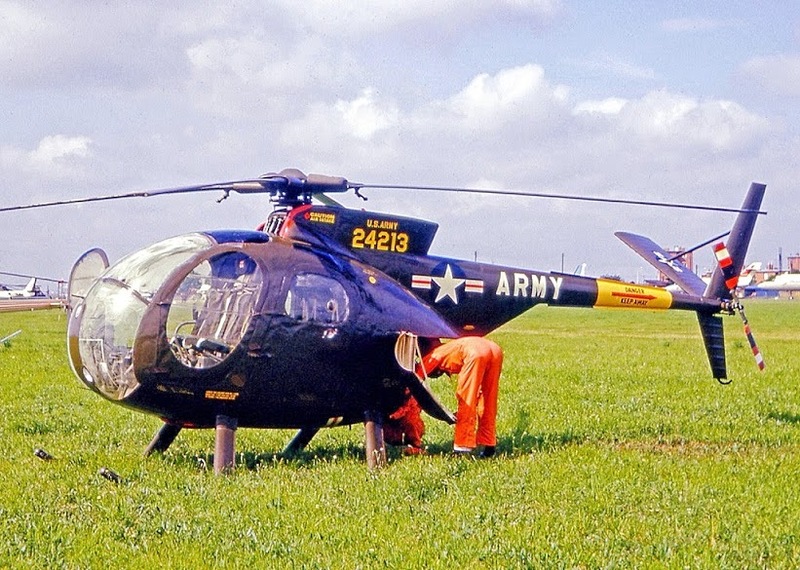 The YOH-6A was powered by a T63-A-5 turboshaft engine (Allison Model 250-C10) mounted behind the cabin at a 45° angle. The engine was rated at 212 shaft horsepower at 52,142 r.p.m. (102% N1) and 693 °C. turbine outlet temperature for maximum continuous power, and 250 shaft horsepower at 738 °C., 5-minute limit, for takeoff. Production OH-6A helicopters used the slightly more powerful T63-A-5A (250-C10A) engine. 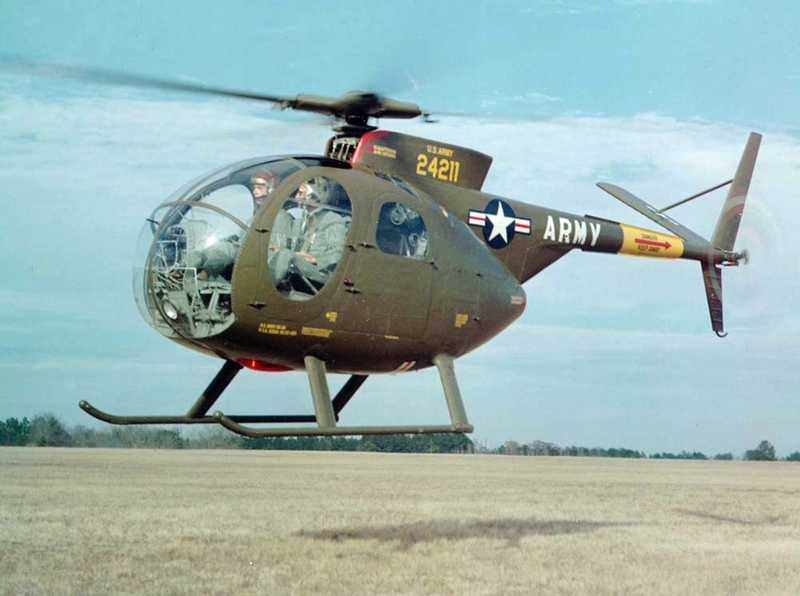 The Hughes Tool Company Aircraft Division built 1,420 OH-6A Cayuse helicopters for the U.S. Army. The helicopter remains in production as AH-6C and MH-6 military helicopters, and the MD500E and MD530F civil aircraft. Hughes YOH-6A 62-4213 is in the collection of the United States Army Aviation Museum, Fort Rucker, Alabama. ¹ FAI Record File Numbers 784, 785 and 11655. ² FAI Record File Numbers 786, 787 and 11656. ³ FAI Record File Number 762. 27 March 1966: At Edwards Air Force Base in the high desert of southern California, Hughes Aircraft Company test pilot Jack Louis Zimmerman flew the third prototype YOH-6A Light Observation Helicopter, 62-4213, to set six Fédération Aéronautique Internationale (FAI) World Record for Altitude and Time-to-Climb. The records were set in two sub-classes, based on the helicopter’s take-off weight. Fifty-three years later, one of these records still stands. Zimmerman took the YOH-6A from the surface to a height of 3,000 meters (9,843 feet) in 4 minutes, 1.5 seconds ;¹ and to 6,000 meters (19,685 feet) in 7 minutes, 12 seconds.² The helicopter reached an altitude in level flight of 8,061 meters (26,447 feet).³ 9921 remains the current record for helicopters in Sub-Class E-1b, with a takeoff weight of 500–1,000 kilograms (1,102–2,205pounds). 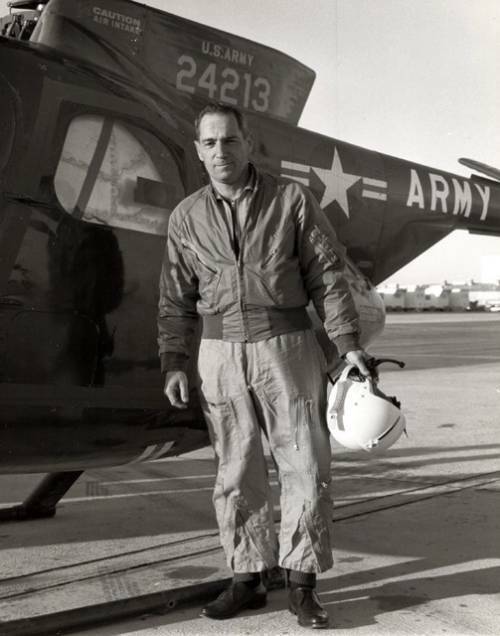 One day earlier, 26 March, Allison Engine Company test pilot Jack Schweibold flew the same YOH-6A to set three Fédération Aéronautique Internationale (FAI) World Records for Distance Over a Closed Circuit Without Landing of 2,800.20 kilometers (1,739.96 miles).⁶ One week earlier, 20 March, Jack Zimmerman had set a Fédération Aéronautique Internationale (FAI) World Record for Distance Over a Closed Circuit Without Landing of 1,700.12 kilometers (1,056.41 miles).⁷ Fifty-three years later, these four World Records still stand. U.S. Army Hughes YOH-6A prototype 62-4213 at Le Bourget, circa 1965. ⁶ FAI Record File Numbers 786, 787 and 11656. ⁷ FAI Record File Number 762. 26 March 1966: Allison Engine Company test pilot Jack Schweibold flew the third prototype Hughes Aircraft Company YOH-6A Light Observation Helicopter, 62-4213, to set three Fédération Aéronautique Internationale (FAI) World Records for Distance Over a Closed Circuit Without Landing of 2,800.20 kilometers (1,739.96 miles), including an Absolute Record for Class E (Rotorcraft).¹ These records still stand. Jack Schweibold wrote about the record flight in his autobiography, In the Safety of His Wings (Holy Fire Publishing, DeLand, Florida, 2005). He was one of a group of military and civilian test pilots selected to attempt a series of world record flights at Edwards Air Force Base, in the high desert of southern California. From 20 March to 7 April 1966, they flew 62-4213 over a series of distances and altitudes. Jack Schweibold’s record attempt began at midnight to take advantage of the cold desert air. The cold-soaked YOH-6A had been fueled with pre-cooled JP-5 in order to get the maximum amount of fuel on board. In addition to the standard fuel tank, two auxiliary tanks were placed in the cabin. The helicopter was so heavy from the overload that it could not hover. Jack made a running take-off, sliding the skids across the concrete until the increasing translational lift allowed the aircraft to break free of the ground. He began a very shallow climb. Schweibold was flying a 60 kilometer (37.28 miles) closed course, but because of the near total darkness, he flew on instruments and was guided from the ground by Air Force test range radar controllers (Spatial Positioning and Orientation Radar Tracking, call sign SPORT). Accuracy was critical. The attempt would be disqualified if the helicopter cut inside of a pylon—which Jack could not see—but if he flew too far outside, the extra distance flown would not be counted and time would be lost. The maximum range would be controlled by the amount of fuel carried in the three tanks, and by the endurance of the pilot. Throughout the flight, Jack gradually increased the altitude, as the T-63-A-5 turboshaft would be more efficient in thinner, colder air. He was flying a precisely calculated profile, taking into consideration aerodynamic drag, the efficiency of the helicopter’s rotor system, and the performance characteristics of the engine. He had been airborne for four hours before he climbed through 10,000 feet (3,048 meters). On the final lap, at 22,000 feet (6,706 meters) Jack had to fly around a towering cumulus cloud and radar contact was lost. He dived to lose altitude and popped out from under the cloud about a half-mile short of the runway. When he shut down the engine, Jack Schweibold had flown the prototype YOH-6A 2800.20 kilometers (1,739.96 statute miles), non-stop. His record still stands. Jack set 30 FAI World Records between 1966 and 1986. 26 of these remain current. Frederick Jack Schweibold was born at Toledo, Ohio, 8 November 1935, the son of Henry E. and Jeanette Schweibold. He attended Ohio State University and majored engineering. He had enlisted in the United States Naval Reserve in 1952 and then joined the United States Air Force as an Aviation Cadet in 1954. 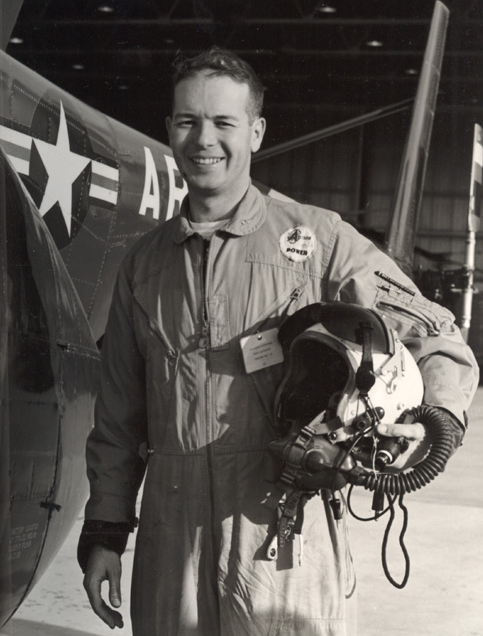 Schweibold went through pilot training at Randolph Air Force Base, San Antonio, Texas, flying the T-34 and T-28. He went on to train in the B-25 at Reese Air Force Base, Lubbock, Texas. He was commissioned as a second lieutenant and received his pilot’s wings in July 1957. In a momentary decision, he selected helicopter training. After leaving the Air Force, Jack flew Sikorsky S-55s for Chicago Helicopter Service, then Bell 47s for Butler Aviation. In 1960, he was hired by the Allison Division of General Motors as a test pilot and engineer for the new 250-series turboshaft engine. 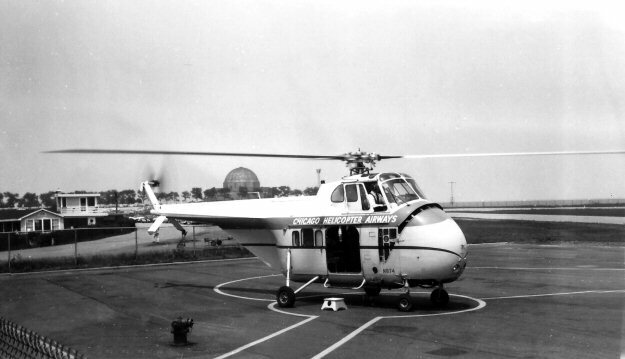 A Chicago Helicopter Airways Sikorsky S-55. I had the good fortune to have known Jack Schweibold. I first met him through his involvement in the Helicopter Association International’s biennial flight instructor re-certification seminars, held during the HAI’s annual conventions. He kept the seminar classes on track, and in between, was always available for questions. Jack was the authority on Allison’s 250-series turboshaft engines, and over the years I often called him for technical information and operational advice. On top of that, Jack Schweibold was just an all-around nice guy. It was a pleasure to know him. 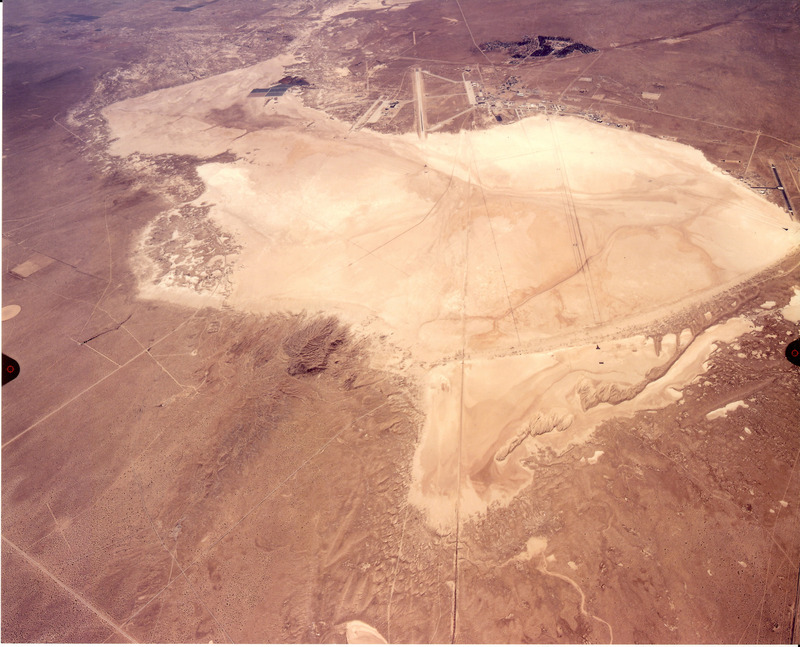 20 March 1966: At Edwards Air Force Base in the high desert of southern California, Hughes Aircraft Company test pilot Jack L. Zimmerman flew the third prototype YOH-6A Light Observation Helicopter, 62-4213, to set a Fédération Aéronautique Internationale (FAI) World Record for Distance Over a Closed Circuit Without Landing of 1,700.12 kilometers (1,056.41 miles).¹ Fifty-three years later, this record still stands. Jack Louis Zimmerman was born 1 September 1921 at Chicago, Illinois, the second of three children of Bernard Zimmerman, an electrician, and Esther Rujawski Zimmerman. 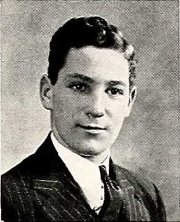 Jack graduated from Hirsch High School in Chicago in 1940. He then studied engineering at the University of Chicago, but left to enlist in the U.S. Army Air Corps. He graduated from flight school in 1943 and was commissioned a second lieutenant. 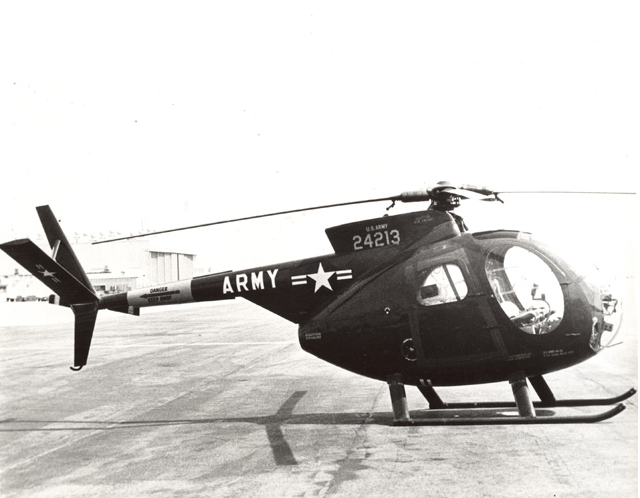 Lieutenant Zimmerman was sent to Freeman Field, Indiana, as part of the Army’s first class of student helicopter pilots, training on the Sikorsky R-4. On completion of training he was assigned to a Liberty ship in the western Pacific as part of a Project Ivory Soap Aviation Repair Unit. Following World War II, Jack Zimmerman was employed as a commercial pilot, and then a test pilot for the Seibel Helicopter S-4 and YH-24 light helicopters, and when the company was bought by Cessna, he continued testing the improved Cessna CH-1 and UH-41 Seneca. 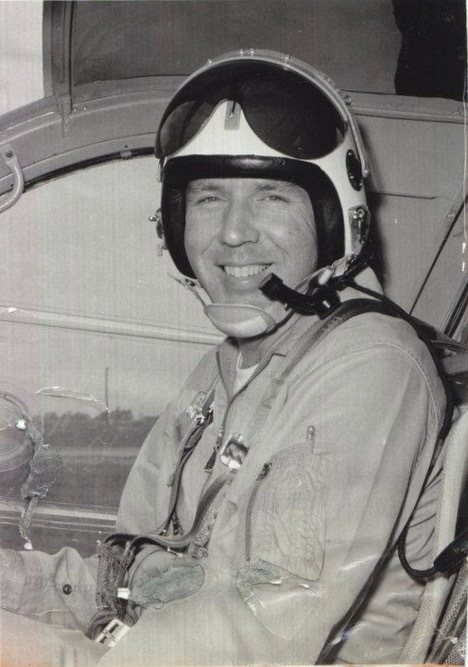 In 1963, Zimmerman began working as a test pilot for the Hughes Tool Company’s Aircraft Division. He retired in 1982. Jack Louis Zimmerman died at San Diego, California, on his 81st birthday, 1 September 2002.